Synthetic peptide corresponding to 15 amino acids near the center of human Bmi1. 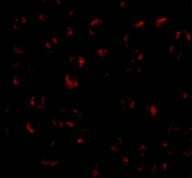 WB: K562 cell lysate. ICC/IF: Rat fibroblast cells; K562 cells. IHC-Fr: Rat brain tissue. IHC-P: Rat acute rheumatic heart disease (RHD) tissue. Our Abpromise guarantee covers the use of ab38295 in the following tested applications. WB Use a concentration of 0.5 - 1 µg/ml. Predicted molecular weight: 37 kDa.Can be blocked with Human Bmi1 peptide (ab39733). Monoubiquitinated (By similarity). May be polyubiquitinated; which does not lead to proteasomal degradation. ab38295 staining Bmi1 in Rat brain tissue sections by Immunohistochemistry (IHC-Fr - frozen sections). Tissue was fixed with paraformaldehyde and blocked with 5% serum for 1 hour at 25°C. Samples were incubated with primary antibody (1/300) for 10 hours at 4°C. 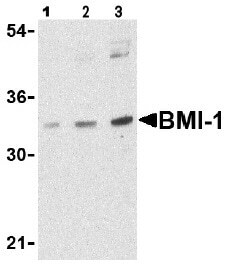 An Alexa Fluor® 555-conjugated Donkey anti-rabbit IgG polyclonal (1/300) was used as the secondary antibody. ab38295 staining Bmi1 in Rat fibroblast cells by ICC/IF (Immunocytochemistry/immunofluorescence). Cells were fixed with paraformaldehyde, permeabilized with 0.01% Triton X-100 and blocked with 2.5% Goat serum for 10 minutes at 25°C. Samples were incubated with primary antibody (1/300) for 2 hour at 25°C. 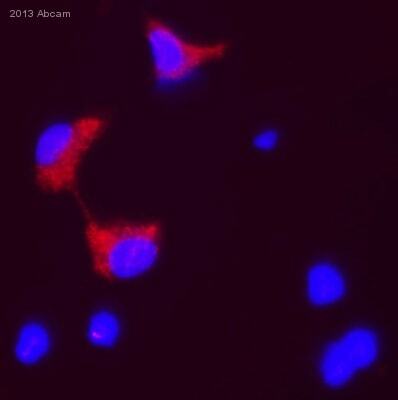 An Alexa Fluor® 555-conjugated Goat anti-rabbit IgG polyclonal was used as the secondary antibody. 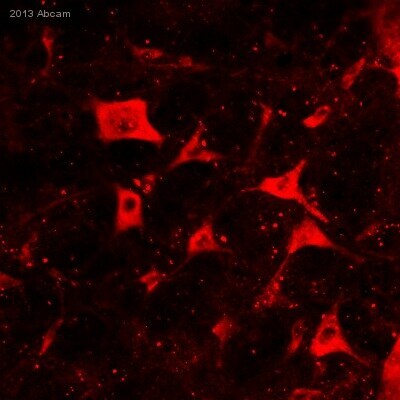 Immunofluorescence of BMI-1 in K562 cells using ab38295 at 20 ug/ml. Publishing research using ab38295? Please let us know so that we can cite the reference in this datasheet.